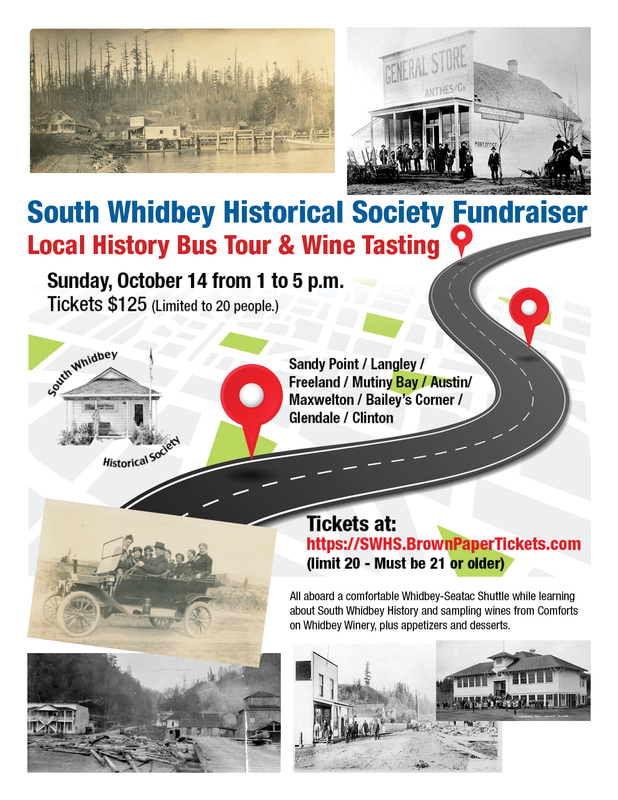 JOIN US for a fun FUNDRAISER that’s sure to raise your local history IQ — our South Whidbey history bus tour and wine tasting event on Sunday, October 14 from 1 to 5 p.m..
We’ll meet at the South Whidbey Community Center in Langley (the former Langley Middle School) and have a brief orientation of the tour. Then we’ll board a comfortable Whidbey-SeaTac Shuttle bus and begin our local tour of Sandy Point (Brown’s Point) / Langley / Freeland / Mutiny Bay / Austin/ Maxwelton / Bailey’s Corner / Glendale / and Clinton. You’ll enjoy and learn about local wines from Rita Comfort of Comforts on Whidbey Winery and have an opportunity to purchase your favorite wines at the end of the tour. Appetizers and desserts will complement the wines. South Whidbey Historical Society Board Members and Museum Docents Bob Waterman, Betty Discher, Joan Handy and Bill Haroldson will provide interesting facts about indigenous people and pioneer settlers. You’ll also receive a booklet of photos of how the towns and area looked more than 100 years ago. There will be a 20-minute walking tour of Langley where Bob Waterman will explain its development and colorful events and characters. The tour will take place rain or shine, so bring comfortable walking shoes and an umbrella and/or rain-jacket. Several restroom stops are available on the tour. Varieties of Martinelli’s Sparkling Cider will be provided for those participants not wanting to partake in the wine-tasting. Refunds up until the Sunday prior to the event, then only in the form of a half-price discount towards a future ticket for a future bus historical tour. Tickets are limited to 20 participants. Must be 21 or older. Come and support your local history museum in a way that’s fun, entertaining and informative.